Operating systems nowadays have inbuilt voice recognition software but only some of that work properly. To overcome this, there are many other software which come along with some big price tags. But their are many freewares that enables voice recognition that can be very handy if you want to have fun with them. Let’s see the best and the free list of free speech / voice recognition software which do the job exactly as expected. If you have used any of these in the past, please share your experience and also let us know which one of these is better than others. Cmusphinx : CMUSphinx toolkit is a leading speech recognition toolkit with various tools used to build speech applications. 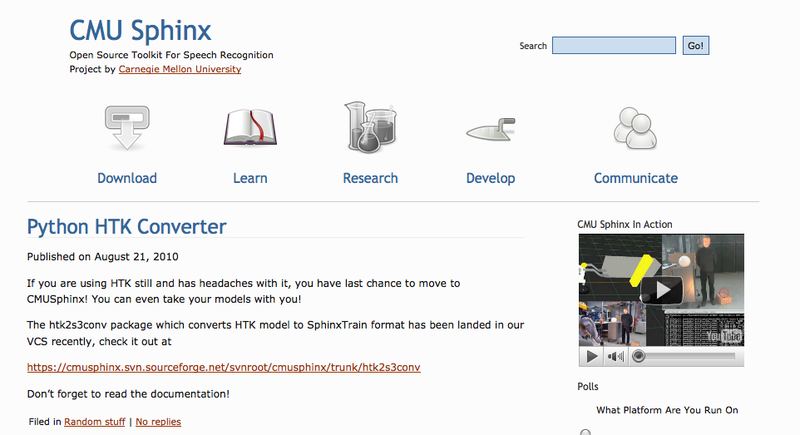 CMU Sphinx toolkit has a number of packages for different tasks and applications. Emacspeak : Emacspeak is a speech interface that allows visually impaired users to interact independently and efficiently with the computer. Audio formatting –a technique pioneered by AsTeR— and full support for W3C’s Aural CSS (ACSS) allows Emacspeak to produce rich aural presentations of electronic information. Festival Speech Synthesis System: Festival offers a general framework for building speech synthesis systems as well as including examples of various modules. As a whole it offers full text to speech through a number APIs: from shell level, though a Scheme command interpreter, as a C++ library, from Java, and an Emacs interface. Festival is multi-lingual (currently English (British and American), and Spanish) though English is the most advanced. Modular Audio Recognition Framework : MARF is an open-source research platform and a collection of voice/sound/speech/text and natural language processing (NLP) algorithms written in Java and arranged into a modular and extensible framework facilitating addition of new algorithms. MARF can run distributedly over the network and may act as a library in applications or be used as a source for learning and extension. NonVisual Desktop Access : NonVisual Desktop Access (NVDA) is a free and open source screen reader for the Microsoft Windows operating system. Providing feedback via synthetic speech and Braille, it enables blind or vision impaired people to access computers running Windows for no more cost than a sighted person. Major features include support for over 20 languages and the ability to run entirely from a USB drive with no installation. Ivona : IVONA TTS is a programme developed by IVO Software converting text to speech and used in many trades and market segments. Its technological potential, high speech quality comparable with human speech, variety of voices, codecs and licenses contribute to the fact that it is used by both large corporations and small enterprises. eSpeak : is a compact open source software speech synthesizer for Linux, Windows, and other platforms. It uses a formant synthesis method, providing many languages in a small size.